Welcome to the introduction of my newest book and DVD project entitled, The NOW Prophecies. I have limited my upcoming engagements in order to devote all of my attention to this inspired work. The teaching DVD is almost completed and will be made available for purchase in November, 2015. The book launch is scheduled for early next year and book presales should be available in December, 2015. The backstory to this project starts at 1:59 a.m. on the early morning of Friday, October 16, 2015, when I was awoken from a dream by a phone call. It was an unfamiliar phone number from a overseas country. I initially thought it was my phone alarm ringing, which had been set for 6:30 a.m. to take my grandchildren to school that morning. This was going to be a special occasion as my wife and I were visiting them on vacation. This line of reasoning might strike you as odd, considering the fact that I was awoken from a dead sleep and my mental faculties were far from functioning. I mean, It was dark out and I hadn’t even ingested my first cup of coffee, which essentially means, I’m operating in do not disturb mode! However, it was the dream that got me thinking this way. It prompted me to get up, rather than sleep in until the alarm would go off. I recognized that if I went back to sleep I would probably forget the details within the dream. So I got up to pray about the dream. I even saved the phone number from the mysterious caller and a few days later returned the call, but guess what? It was a wrong number that belongs to someone in an African country who doesn’t speak a lick of English. Did man’s mistake equal God’s providence in this matter? (i) I believe so, the errant phone call served as an important wake up alert to get me working on the NOW Prophecies project. “That’s it,” I said to myself in the dream. “That’s what the Lord wants me to do. He has given me the perfect name for my next project.” Still dreaming, I marveled in a blissful state about this inspired message. A few minutes into my bliss the phone rang, and all of the above occurred. Immediately after dropping the grandkids off at school I began writing “The NOW Prophecies.” The words flowed from my fingers to the keyboard like a fountain overflowing with water. The culmination of my years of research was being encapsulated into an easy to understand book and DVD that would be made available for the average American household. The exhaustive debates about the accuracy of my discernments of the NOW prophecies have already been published in my prior works. They are available for any reader that wants to achieve a deeper understanding about these prophecies. Therefore, I’m not going to rehash the arguments that have already been addressed. This project is not intended to improve upon what was previously revealed, but rather it exists to inform the masses about the coming globally impacting events. The prophecies that this generation needs to prepare for. The ancient predictions that are going to happen NOW! CAVEAT: The title and the concept of The NOW Prophecies book were inspired by my dream. However, the details and the content were the product of biblical research combined with prayer and circumstantial confirmations. Whether or not this is a Holy Spirit inspired work will be for you to discern. I sincerely believe that this book will provide you with the invaluable information that you need to know NOW! 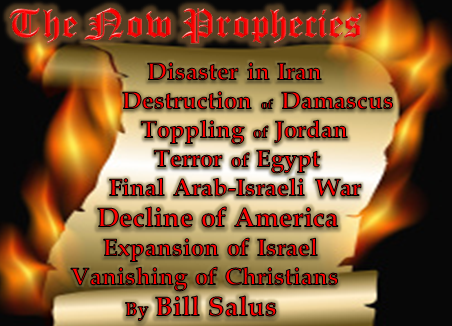 What are the NOW Prophecies? The NOW Prophecies are the unfulfilled ancient biblical predictions that appear to be imminent, which means they could happen at any time. These foretellings have either minor or no remaining preconditions inhibiting them from happening now or in the very near future. The NOW Prophecies deal with the most relevant information for this present generation, because they describe events that will likely find fulfillment during its existence. All unfulfilled biblical prophecy is important to understand, but of most value to any given generation, past, present or future, is the information that was specifically provided through the ancient Hebrew prophecies for its benefit. Noah was given a NOW Prophecy about a forthcoming worldwide flood. Joseph’s NOW Prophecies dealt with seven years of plenty that would be swallowed up by seven years of ensuing famine in Egypt. The prophet Jeremiah warned about seventy years of desolation in Judah and dispersion from Judah. In all of these instances it was the NOW Prophecies that benefited the affected populations the most. The timely predictions enabled the peoples to prepare for the powerful events that directly affected them! The NEXT Prophecies are those that follow the fulfillment of the NOW Prophecies. In essence, the NOW’s provide the necessary nexus of events that pave the path for the execution of the NEXT Prophecies. Although the NEXT Prophecies are rapidly racing toward fulfillment, they require the completion of the NOW’s in order for their stage to become appropriately set. The LAST Prophecies still have significant preconditions preventing them from finding fulfillment. They will find fulfillment relatively soon, but the LAST’s have to wait in line behind the NOW’s and NEXT‘s for their turn on the prophetic timeline. 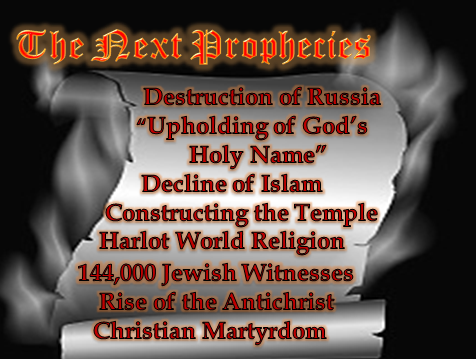 Which are the NOW Prophecies? When will the NOW Prophecies happen? This non-chronologically ordered and non-exhaustive list above identifies prophecies that are ready to happen NOW! However, they don’t all necessarily happen at the exact same time. Therefore, it is important to sequence them chronologically. Sequencing these events is a task tackled later on in this work, but at best it can only be an educated guess. The fact that these predictions are in the NOW category implies that only a minimal amount of time lapses between each event. One NOW episode should trigger the next one to follow relatively promptly on its heels. The birth pain analogy applies in the sequencing of these NOW events. Likened to a woman about to become a mother through the birthing of her child, the NOW’s initiate the process of events leading to the return of Jesus Christ at His Second Coming! As the baby descends down the birth canal, the mother’s contractions become more intense, more frequent, and unstoppable! Similarly, once the NOW Prophecies begin they become more extreme, recurrent and unpreventable! Why are the NOW Prophecies happening? The fulfillment of the NOW Prophecies accomplishes specific purposes within the prophetic plans of God. The end of each episode evidences that the will of the Lord was manifested within and throughout the epic event. For instance, Psalm 83 results in the end of the ancient Arab hatred of the Jews described in Ezekiel 35:5 and 25:15. It also proves that the Lord’s Gentile foreign policy inscribed in Genesis 12:3 remains effectually intact. This is demonstrated by the cursing of the Psalm 83 Arabs for wanting to curse Israel in the prophetic war. Genesis 12:3 pronounces a curse upon those that would curse Israel. To keep updated with the progress of this new project subscribe to our free email newsletter on the right side bar of this website.